Belle seen in The Hunchback Of Notre Dame. Belle makes a cameo appearance during Quasimodo's song "Out There" in the village scene of another Disney movie The Hunchback Of Notre Dame. HD Wallpaper and background images in the Beauty and the Beast club tagged: belle the hunchback of notre dame beauty and the beast cameo quasimodo out there. 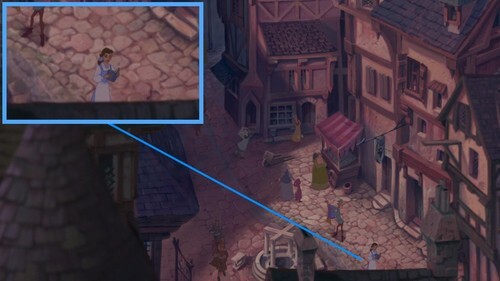 This Beauty and the Beast photo contains brownstone, street, city scene, urban setting, row house, and town house. There might also be tavern, tap house, mansion, mansion house, manse, hall, residence, and redbrick university.